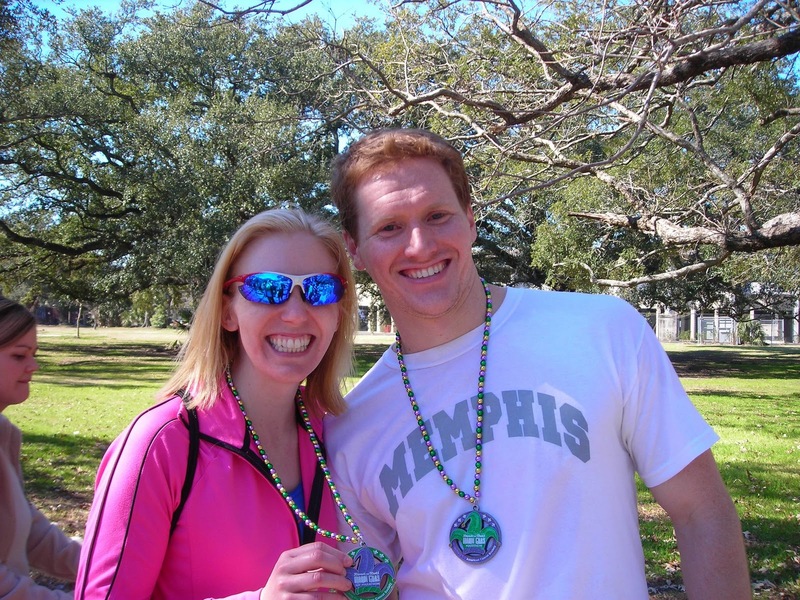 Andrew Jackson was one tough son of a gun – And I firmly believe you had to be one tough son of a gun to run the Andrew Jackson Half Marathon on Saturday, April 9 (and double tough to run the full). With dreams of the wonderful Germantown Half dancing in my head, our friends Ron and Beth treated us to Coletta’s to carbo load the night before (my 29th birthday!). Coletta’s was a favorite of the King, and Bobby and I had never been. The garlic bread with cheese was amazing: It was $1.75 for 2 giant pieces slathered in garlic and cheese! We ordered tons of it. Beth’s lasagna came in a steel crock pot thing – I had never seen it like that. Our Round The World pizza was pretty good (Ron said the BBQ pizza was great too). I loved the retro 50’s artwork on the menu. There was also a menu on the wall from the 70’s when Elvis visited the restaurant – Lasagna was $2, drinks were 20 cents, no alcohol was served and no large sizes were available. We woke up Saturday morning at 4:30am and left the house at 5:00am. I should have gotten up earlier because I didn’t get a chance to eat breakfast or really use the restroom – Strike 1. Got to Jackson by 6:30am. We both ate a Gu for our breakfast, but I could tell it was not very satisfying for me (why didn’t I get up earlier and eat some oatmeal, why?). At packet pickup – guess what – They ran out of small shirts! Well, it was a white shirt anyway, but it was a tech shirt with a fairly good logo so I was kind of bummed. My race (the half) started at 7:30am. Right off the bat – stomach cramp. That is a bad sign right there. It stayed with me for a mile or 2, but wasn’t killer. It was after a couple miles I realized, “Hey, this is a pretty hilly course!”. I just assumed it would be like flat Germantown again. I know Jackson pretty well and never noticed all these non-stop, rolling hills in a car – Strike 2. First 6 miles were pretty good. My niece Shelby even drove by at mile 5 and cheered – that was great! But it sure was hot and windy. And while there were more spectators than Tupelo, it was the longest I’d ever run by myself, and I couldn’t find anyone to chat with. The second half really dragged (would these hills ever stop?). By the end, it felt like I had run a whole marathon! 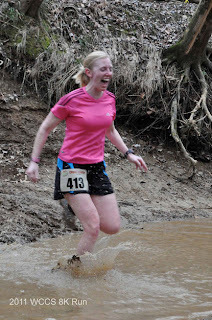 But Shelby was there again to cheer as I finished at 2:28 (Over 20 minutes longer than Germantown 2 weeks ago – argh). We overheard some folks and found out that no full marathoners had come in yet. After 3 hours passed I was surprised no marathoners were in yet, but it was a small race and a testament to the heat and hills. 3:13 finally saw the winner, 3:21 saw Harry “Birdlegs” from Memphis and 3:27 saw Bobby, 3rd overall (and 1st in age group)! We stayed for the half awards (I got nothing; I figured I wouldn’t). We tried to stay for the full awards, but they were taking a really long time! So we picked up Bobby’s trophy and headed back to Memphis to eat some leftover Coletta’s pizza and watch Netflix. Beth and Ron picked us up in their giant suburban Saturday, March 5, and we drove to Little Rock (with the aforementioned McDonald’s stop). A quick stop at Ron and Beth’s hotel, and it was on to the expo! The expo was about the same size at St. Jude’s. Bobby bumped into his running buddies David and Richard who were pacing the 3:35 group. They regaled Bobby with the perks of being a pacer: race fee wavered, free admittance to VIP areas, free hotel room, free neon yellow PACER shirt and best of all – a small sign on a dowel rod. I had actually always wondered if those pacer signs were heavy, and I was allowed to hold it. It was surprisingly light and the pacers said it had never given them a neck or shoulder cramp during a race. Where were Bobby, Michelle and I staying in Little Rock? The Governor’s Mansion, of course! The governor is Michelle’s dad’s cousin (practically a brother; they grew up very close). We got a tour of the place from Mike and Ginger. Michelle stayed in a guest room and Bobby and I stayed in a 1 bedroom, 1 bath guest house outside. We stuck with tradition and ate at Olive Garden again for a pre-race dinner. It was packed. 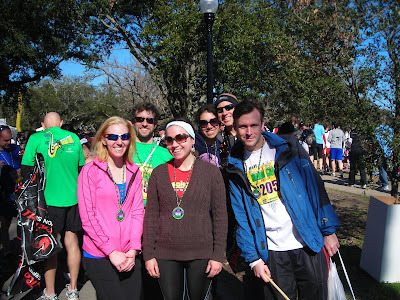 The race was Sunday, March 6 at 8:00am. It was a little colder and cloudier at the beginning (30’s and 40’s) than we all expected. I had luckily brought a throw away hoodie to keep warm, and Bobby wore a new toboggan he had bought at the expo. We saw Katherine while waiting inside a crowded restaurant near the start. This race is definitely smaller than St. Jude or a Rock and Roll Series. There were 4 corrals, but after the wheelchair start we were all off! 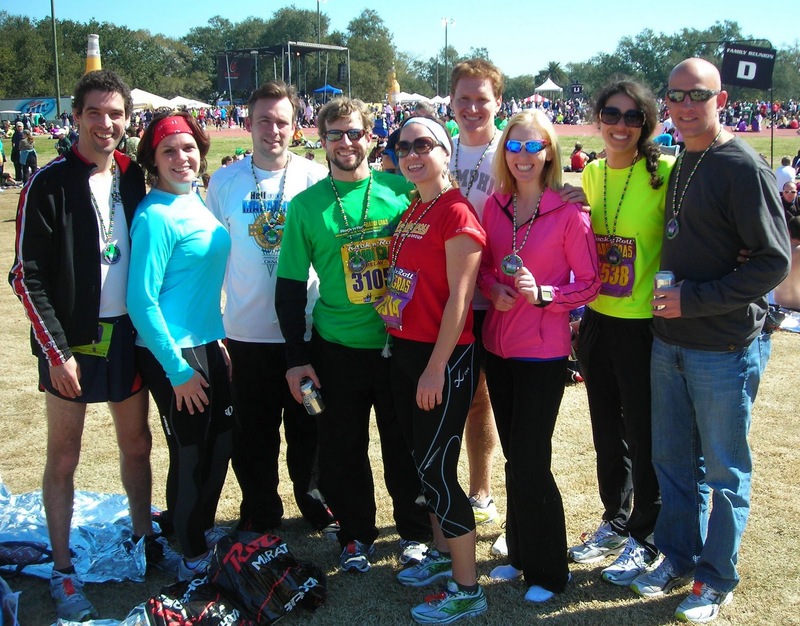 At this race you could put your name on your bib. It was a great touch and total strangers would yell your name out during the race. Bobby decided to be funny and put “Roberto” on his. If we go again I’m going to think of a funny name. The first half had zero hills. I had thrown off my hoodie by mile 4. We grabbed some Mardi Gras beads a church was handing out near mile 12. It was at mile 13 I saw a young guy in dark dress pants, suspenders and black dress shoes running the whole marathon. That would be tough (and he finished too not far after me). The crowd support in Little Rock was the best I’ve ever seen – it was like the whole city was out. People were cheering and giving away free food and drinks the whole race course (Krispy Kreme doughnuts, oranges, frozen margaritas, Sprite, beer, candy, etc). Missy and Billy were waiting at the top of a big hill around mile 16 (in the “Midtown” of Little Rock) with a sign saying, “Go Memphis Runners!”. Missy ran a couple miles with us and chatted with us the whole time – that was such a boost. I passed on the “lipstick stop” at mile 25 where they gave away lipgloss so the marathoners could look good for their finish line photo, and the beer stop right before that. I shouldn’t have! Michelle set a new personal record in the half marathon at 2 hours and 22 minutes! Bobby also had a new personal record for the marathon at 3 hours and 13 minutes. He had started with his buddies in the 3:35 group, but just kept working his way up. He came in 50th overall for the entire marathon (out of 1,814 marathoners)! He was even handed an embossed card inviting him to visit the Capitol Building on a weekday to receive a special gift from the Secretary of Arkansas. I finished at 5 hours and 9 minutes (A little longer than at St. Jude, but I felt a lot better at the end of this race). My running buddy Beth was not far behind at 5:21. Beth said, “Never again,” but I have to say, it was the best race I’ve had so far, and I’d do it next year! If you ran in the 2010 Road Race Series, you should have received a survey in your inbox a day or two ago. Be sure to take it and see if your answers to the three fill-in-the-blank questions can be as creative as my husband’s. 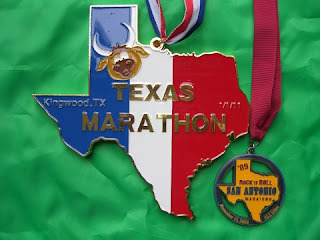 The Texas Marathon in Kingwood, TX may be threatening to usurp Little Rock’s title as “Largest Marathon Finisher’s Medal in the World”. This small race, held on January 1, 2011 had only 650 runners. They have long been known for giving out a really big medal (last year’s was 2.2lbs). But I have heard this year’s was nearly 3.5lbs and the largest in the world so far! Little Rock – Don’t let this po-dunk Texas town take your title! 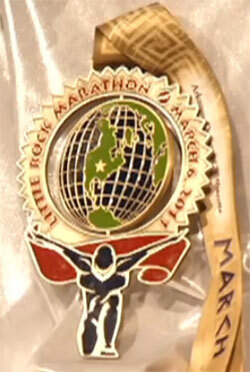 This year’s Little Rock Marathon medal had better be the biggest.